Check out the singer's sassy transformation from Destiny's Child to solo star and now our stylish September cover girl! Kelly first hit the scene as Destiny’s Child midriff baring, red streak wearing songstress. Her go-to costumes were halter tops with matching shorts or pants. Rowland rocked her cropped tops faithfully but paired casually with denim while off the stage. For her solo album debut in 2002, Kelly continues to rock jeans and body hugging tops – with her signature red tresses. Kelly keeps her tresses but ditches the denim at the 2003 GRAMMY’s, accepting her award in a beaded pink opalescent gown. At The Motown 45 anniversary celebration, the singer goes for grown-up glam in a sultry, navel-baring sequin gown. At the 2005 Vanity Fair Oscar Party, Kelly opts for a classic satin, drop-waist dress with sweetheart neckline and matching peep-toe pumps. Kelly dresses up her favorites — blue jeans — with a navy blouse and heels for the “ATL” premier in March, 2006. At a Dolce & Gabanna event in December 2007, Rowland outshines everyone in this satin cocktail dress. In November 2008, Rowland literally sparkles in this glam metallic ombré gown. At the MOBO Awards in September 2009 Kelly rocks all all black everything – punctuated by fierce shoes, which becomes a classic look for her. In 2010, Kelly dares to go there for her stage costumes. At a club performance she suits up in a sultry cut-out top and leather pants. At an E! Entertainment party, Rowland goes wild in a another performance costume – a futuristic, peplum pantsuit. Later that year, Kelly polishes up her look in a sleek one-shoulder jersey dress and lace-up platforms. At Vogue’s Evening in Vogues event, the solo singer keeps up her chic style in a plum bloussant dress with edgy leopard accents. In 2011 it gets better. Kelly kicked off the New Year flyer than ever as a judge on The X-Factor UK. Here she works this svelte exposed midriff midi dress by Versace. Just when you thought she couldn’t get any hotter, the long legged beauty struts her stuff in a cap-sleeve shift dress and cobalt blue Louboutins. At last year’s Glamour Women of The Year Awards, Kelly brings it in a jaw-dropping Maria Grachvoge flower print gown. At the Grey Goose Cherry Noir event, she hit us with another stunner – a gorgeous silky red halter gown and stark white Alexander Wang sandals. The Vegas Magazine cover girl celebrated their 9th anniversary party in a Roberto Cavalli digital stretch print dress and Charlotte Olympia python pumps proving this solo star has clearly come into a style of her own. Kelly Rowland wasn't afraid to work the red carpet at the 85th Annual Academy Awards, styled in a silk black-and-white Donna Karan Atelier gown. We love Kelly Rowland's dazzling Rami Al Ali Spring 2013 silver gown embossed with holographic paillettes at the 2013 Billboard Music Awards. It shows her affinity for shiny red carpet numbers, but now in a more sophisticated way. In a risqué, cutout Georges Chakra couture dress, Kelly Rowland stuns at the 55th annual Grammy Awards. It's in the most casual moments where Kelly exudes confidence. This simple tied T-shirt, leather pencil skirt and metallic pumps was an effortlessly fab moment at the Jaguar and Gilt celebration. 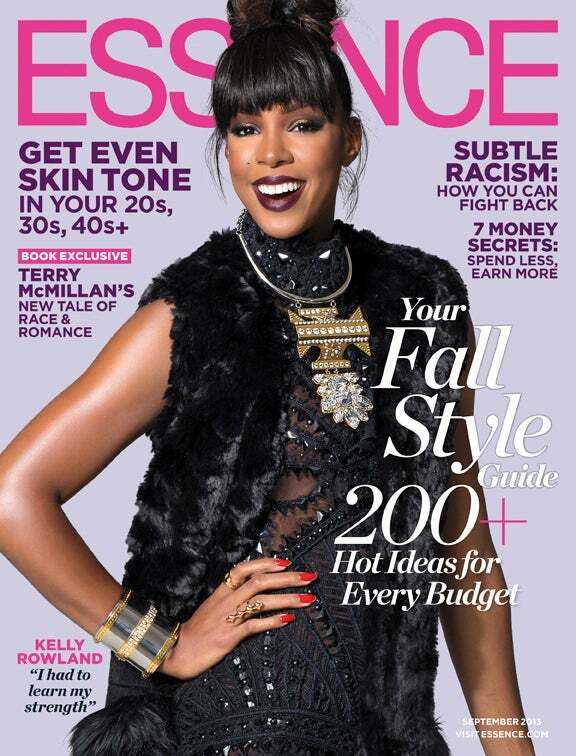 Rowland's hot style has landed her on her first cover for ESSENCE –– the September fashion issue. Quite fitting for the stylish singer.